Horde Mail to PST exporter is an effective way to export Horde Webmail to Outlook even in absence of Microsoft Outlook program. It provides an easy conversion from Horde emails (with attachments) into PST format. Moreover, one can perform selective email migration through this application. Bulk conversion of Horde Mail mailboxes into PST format is possible with this Horde Mail to Outlook converter. Software provides an option to export multiple Horde Mail mailboxes into a single PST file or export each mailbox into a separate PST file. The tool allows you to perform batch conversion of multiple mailboxes into PST with entire emails data. The latest technologies used in Horde Mail to PST converter renders users to import emails to Outlook without any data loss. In addition, the software generates a progress chart in which users can view live status of Horde mail to Outlook conversion. Moreover, this tool is compatible on all Windows versions. The Demo Edition of Horde Exporter Tool will export only 10 items per folder. 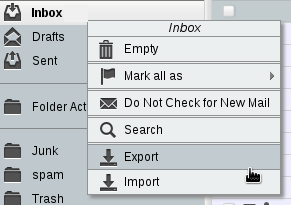 How to export Horde Mail to Outlook by using the tool? First log-in into the Horde mail (c-panel). Then right-click the folder which you want to export. Now, another screen appears on your display, select Export option. Now you can download selected folder either an uncompressed or compressed file (.zip). After downloading folder from Horde webmail, you need to convert downloaded MBOX file into Outlook compatible PST file format to access Horde-Mail data into Outlook email application. Is it mandatory to have Internet connection while exporting emails from Horde webmail to Outlook? Yes, internet connection is required only for downloading mailboxes from your Horde webmail account on your machine. Once you have downloaded mailboxes on your PC, you can close your net connection and use our tool to migrate emails from Horde to Outlook. Is there any Horde mail file size limitation for migrating emails to Outlook with help of your application? No, there is no file size limitation for converting Horde emails into PST with our tool. Horde mail to Outlook software is capable of handling files of any size without any error. What is the type of PST file generated from your Horde email to PST migrator? Unicode PST file is generated from our software, which is supported in MS Outlook 2016, 2013, 2010, 2007, 2003. Will your Horde mail to Outlook converter software work flawlessly even in absence of Microsoft Outlook? Yes, our software is not a dependent utility. No matter whether Outlook is installed on machine or not, The software will transfer Horde-Mail mailboxes to PST file without any hassle. "I was trying to configure Horde Webmail to Outlook but, the procedure failed due to network issue. Then, while surfing internet I came across this application. I downloaded all my emails of Horde Webmail account on system and then used this software for converting downloaded data into PST. It became an easy procedure for me to migrate emails from Horde web account to Outlook only because of this Horde email to Outlook software." "The mobile app available for Horde was not properly working in my smartphone therefore, I decided to migrate data from Horde mail account to Outlook. It is so because my friends suggested me that Outlook mobile app is more secure and safe for me. Thus, I used this application to export Horde email to Outlook, which was possible for me to perform in absence of any trainer and without any complications." "I have used this Horde webmail to PST exporter, and I found the tool is the exact solution to import Horde mail into outlook email application. With the help of this software I am able to access Horde webmail data into Outlook email client. Thanks for the utility."